SEAT has today announced it is working on its first electric car designed, developed and manufactured in Spain. And, as well as unveiling the prototype Altea XL Electric Ecomotive, a totally electrically-driven zero-emissions car, the Spanish manufacturer also presented the prototype Leon TwinDrive Ecomotive, a plug-in hybrid. Over the next few months SEAT will make available units of both models to governmental institutions in Catalonia and Madrid for use in their vehicle fleets. This will provide SEAT with valuable information on use of the cars for assessment with a view to mass production of electric vehicles in the medium-term. The company envisages the launch of its first electric plug-in hybrid car in 2015, to be followed a year later by an all-electric car. SEAT's strategy is to commit to a wide range of alternative technologies. To this end the Spanish manufacturer is unveiling two different but complementary models at the same time. SEAT's President James Muir stated: "Customers demand a more sustainable form of mobility, but their needs are diverse. Therefore, we believe that a parallel strategy of developing two different technologies will put SEAT in the best position to meet their needs". The announcement of the launch of the first electric vehicles coincides with the start of the biggest new product offensive SEAT has known. The company will be launching four new models onto the marketplace over the forthcoming twelve months. The first will be SEAT's new urban vehicle - the Mii. The future of electromobility in Spain depends not only on vehicles but also their components such as batteries, as well as a recharging infrastructure. For this reason SEAT – the number one industrial investor in R&D in Spain – is heading the CENIT VERDE project. This public-private-partnership between manufacturers, universities, research centres and the Spanish Ministry of Science and Innovation is taking a holistic research approach to making the electric vehicle a reality in Spain. The Altea XL Electric Ecomotive blazes the trail for electromobility in Spain. It has a range of 135 kilometres and as with all its vehicles, SEAT guarantees driving pleasure with an engine producing 115 hp (85kW) and 270 Nm of torque. This amount of power translates into a limited top speed of 135 kph. With its roomy passenger compartment and generous boot, the electric Altea XL is equally suitable for family or transport company use. By intelligent location of the batteries under the rear seats and the boot, there is no intrusion on the passenger compartment. A sophisticated regeneration system with adjustable braking torque optimises energy use. And when the electric Altea XL is parked in the sun, the rooftop photovoltaic cells recirculates fresh air inside the passenger compartment reducing the energy needed afterwards by the climatic system. Dr. Matthias Rabe, executive Vice-president for R&D, has stated that "SEAT has its electric future assured. With the electric Altea XL we are showing just how mature our technology is". He added "the electric Altea XL was an intentionally studied choice for the first fleet. It will enable us to experiment with a wide variety of uses". The new SEAT Leon TwinDrive Ecomotive is a ground-breaking concept in the field of plug-in hybrids, by combining the advantaged of emission-free driving with the range of a traditional internal combustion engine vehicle. In electric mode the TwinDrive has a range of 52 kilometres, with a top speed of 120 kph. In combined mode (electrical plus combustion) the consumption forecast is only 1.7 litres of fuel or 18.5 kWh per 100 kms, the equivalent of a rock-bottom 39 g/km of CO2, with a top speed of 170 kph. In the words of Dr. Matthias Rabe, SEAT executive Vice-president for R&D "the Leon TwinDrive Ecomotive is an exciting and ground-breaking solution. Technically, it allows you to drive in all-electric mode, while at the same time enjoying smart hybrid drive". To which he adds "Thanks to its great range, none of our customers will need to change their lifestyle or transport habits". The Altea XL Electric Ecomotive and Leon TwinDrive Ecomotive do not constitute SEAT's first venture into the field of sustainable mobility and commitment to environmental protection. 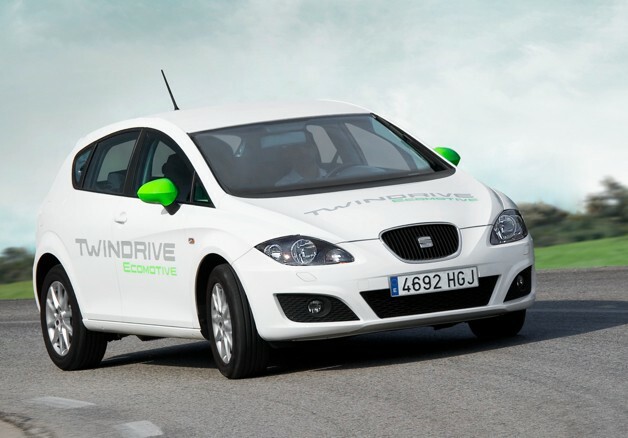 The Spanish brand has a long track record in the manufacture of low-emission vehicles. More than 60% of vehicles marketed in Spain by SEAT have emission levels below 130 g/km of CO2. The star of the range is the Ibiza Ecomotive, with a combined consumption of just 3.4 litres and emissions of no more than 89 g/km from its 75 hp (55 kW) engine. Additionally, SEAT continues to broaden the Ecomotive range by adding versions of the Leon, Altea, Altea XL, Alhambra and SEAT's new urban car the Mii, with equally benchmark consumption figures. SEAT has extended its environmental commitment to its car-manufacturing processes, furthering different projects with a single aim – to reduce CO2 emissions and make a more sustainable and efficient use of energy resources. By way of example, one innovation at SEAT has been the implementation of Energest, an energy consumption management system enabling more efficient energy use and savings of 3,900 tonnes of CO2 per year. Its strategic approach to environmental protection has earned SEAT several plaudits. One of the most recent was the first-ever awarding of the ISO 50.001 standard in energy efficiency to a Spanish company. The most outstanding project within its strategy is 'SEAT in the Sun', the largest rooftop photovoltaic facility in Spain, and the biggest of its kind in the European automotive industry. Equally innovative was the decision to install the photovoltaic plaques on the temporary holding areas for vehicle protection. Capacity has doubled from 4 to 8 megawatts over the past few weeks thanks to the start-up of a new stage. Next year will see the completion of this project with connection of the final stage, taking installed power to 10.6 MW. This means that 'SEAT in the Sun' will have reduced CO2 emissions by 6,200 tonnes per year. As a company, SEAT is also a pioneer in the use of the railway for the transport of vehicles and components. In 2008 the company opened Autometro, a rail link between Martorell and the Port of Barcelona for the transport of finished cars. Currently SEAT exports more than 40% of its production by sea, and 95% of those vehicles reach the Port of Barcelona via rail. In 2009 the company set up Cargometro, linking SEAT's Martorell production plant with the Zona Franca facility. Taken together, the two rail links take some 57,000 heavy lorry trips off the roads – a reduction of 2,600 tonnes in CO2 emissions per year. Going forward, the Mediterranean corridor will enable SEAT to strengthen its rail strategy even more by increasing its current level of export by train from the current 11% to 30%. SEAT is the only company in its sector with the full-range capacity to design, develop, manufacture and market cars in Spain. A member of the Volkswagen Group, the multinational has its headquarters in Martorell (Barcelona), exporting approximately 75% of its production to 72 countries. SEAT is the market leader in Spain, and in 2010 reached a turnover amounting to 4.7 billion euros, with total sales of 339,500 vehicles. SEAT Group employs 13,000 professionals at its three production centres in Barcelona - Zona Franca, El Prat de Llobregat and Martorell, where it manufactures the highly successful Ibiza and Leon, amongst other models. The Volkswagen Group production facility at Palmela in Portugal supplies the SEAT Alhambra. The Spanish multinational also has a Technical Center, a 'knowledge hub' bringing together more than 900 engineers whose goal is to be the driving force behind innovation for the number one industrial investor in R&D+i in Spain. In line with its declared commitment to environmental protection, SEAT undertakes and bases its core activity on sustainability, namely reduction of CO2 emissions, energy efficiency, as well as recycling and re-using of resources.